Both saltwater and chlorine systems clean and sanitize with chlorine through different approaches. A chlorine pool directly adds chemicals to the water through a system of filters to circulate and clean. A saltwater pool uses an electrolysis device to create its own chlorine from salt, and sends a constant stream of the chemical into the pool. No more mixing, measuring and messing around with liquid or tablet chlorine again. Now you can automatically turn ordinary salt into a self-regenerating supply of pure chlorine for pool and spa water that&apos;s clean, clear and luxuriously soft. Electronic chlorine generation has become the simple, safe and affordable alternative to using harsh, chemically-produced chlorine to sanitize pools and spas. 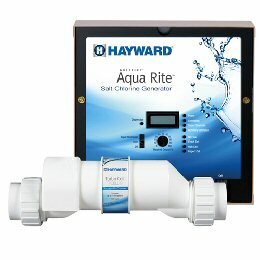 Hayward has solutions for DIY&apos;ers and for those that would rather leave it to the pros. Ask about alternative types of sanitization for your pool. Some of those types are Ozone OzoneOzone is made from Oxygen or O2, which is converted through electricity to Ozone or O3. Ozone is a much more powerful oxidant than chlorine. However, the “shelf life” of Ozone is limited. It must be manufactured and used on-site. This is done through Ozone Generators which convert Oxygen in the air into Ozone., UV UVThe sun emits invisible light. This natural phenomenon is reproduced inside the chamber of the Delta UV ranges UV systems using powerful lamps, result of leading edge technology, that emit UV-C rays. At 254 nanometers, the optimum wavelenght for destroying micro-organisms (viruses, bacteria, algae, yeasts, mold...), the UV-C penetrate to the heart of DNA (altering the DNA of the microorganisms in a process called thymine dimerization) and disturb the metabolim of cells until thay are totally destroyed. UV is effective at inactivating bacteria, viruses and protozoa such as Cryptosporidium and Giardia. and Copper Silver Ionization Systems Copper Silver Ionization SystemsCopper ion systems use a low voltage current across copper bars (solid copper, or a mixture of copper and zinc or silver) to free copper ions into the flow of pool water to kill organisms such as algae in the water and provide a “residual” in the water. Alternative systems also use titanium plates to produce oxygen in the water to help degrade organic compounds.. There are automated systems to automatically feed your chemicals so you don't have to mess with them. Just ask Poolscapes to tell you more about alternative solutions and they will they recommend the right system for you specific needs. Water chlorination is the process of adding the element chlorine, usually Calcium Hypo chloride or a stabilized form called Trichlo(Trichloro-s-triazinetrione) tablets, to water as a method of water purification to make it fit for human use. Water that has been treated with chlorine is effective in preventing the spread of waterborne disease. It&apos;s amazing what a little salt can do to enhance your swimming experience. You can forget about mixing, measuring, and messing around with harsh liquid or tablet chlorine. You can say goodbye to itchy skin, red eyes, and heavy chemical odors. Now there&apos;s an easy, efficient, and cost-effective way to chlorinate your spa and pool.